I’m excited to announce that I’ve compiled an anthology of some of my most popular personal essays, and made them available as an e-book. The collection is entitled Raw Materials, and includes revised and updated versions of each piece, with new author’s notes after each one, plus an exclusive extra essay written especially for the collection. It’s around 90 - 100 pages long, and you can read it either on a Kindle device, or in the free Kindle app on your Mac, PC, iPhone, iPad or other device. I do hope that you’ll take a look. 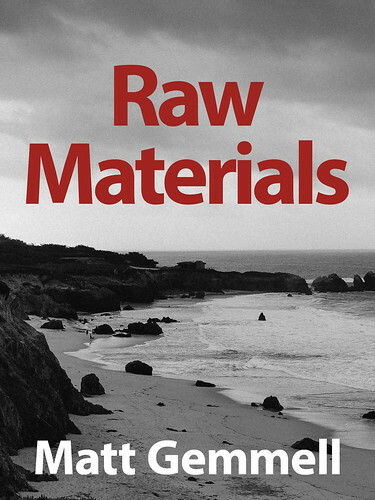 Raw Materials is now available on the Amazon.com Kindle Store, and also on Amazon.co.uk and your own local Kindle Store. You can also buy it on Apple iBooks, or buy a bundle of all three formats (Kindle, iBooks, and PDF). I put this anthology together in thanks for your readership over the years. These pieces are the ones that have consistently generated the most moving email and personal feedback. As I mention in the foreword, I think that sharing our own difficult stories has the greatest potential to unite us. There’s something you can do to help me, too: if you enjoy the pieces, please write a review on Amazon. Those reviews are the lifeblood of Kindle books, and promote visibility for the author. This isn’t a money-making venture for me, but rather a lead-in to publishing my first novel later this year, and fully embarking on my new career. If you’ve found relevance or enjoyment from my words over the years, this would be a meaningful way to let me know. I hope you’ll enjoy the book. Once again, Raw Materials is available on the Amazon.com Kindle Store, and also on Amazon.co.uk or your own local Kindle Store. You can also buy it on Apple iBooks, or buy a bundle of all three formats (Kindle, iBooks, and PDF).